Medical advancements are often a derivative of the suffering of others. And often, society reaps the benefits without knowing the names or histories of those who made it possible for us to treat and avoid certain medical conditions. A 16-year-old Rebecca Skloot understood this when one day during a biology class when the topic of HeLa cells were being taught. In conclusion of the lesson, the name of a woman was written on the blackboard and soon erased. No other information was given, except that she was a black woman. This book has recently been challenged by a Tennessee mother of a 15-year-old high school sophomore who deemed the book “pornographic.” Having read the work, including the so-called offending passages, this strikes me as preposterous for a number of reasons. First, although the description is vivid in detail it is mainly informative and not at all written with the intent to arouse. Secondly, the mention of Henrietta’s husband’s infidelity and resulting venereal diseases is just that, a mention. Thirdly, this day in age the average 15-year-old picks up more offensive language and spectacle on the street or by watching the VMAs. I certainly don’t think the accounts briefly mentioned in the book is enough to justify depriving readers from learning the once buried history of one of the most important contributors to modern science. Henrietta’s cells (HeLa cells) aided scientists in cancer and AIDS research, gene mapping, Polio vaccine development, and various other scientific endeavors. Though the medical advancements achieved with the HeLa cells are celebrated all over the world, the road to scientific victory has a checkered history peppered with injustice and immorality. Skloot highlights some of the experiments used on terminally ill patients and the details read like a horror story, mainly because in many ways it is. The Immortal Life of Henrietta Lacks happens to be one of my most recent reads and one of the most informative books I’ve come across in years. Until recently, I hadn’t heard of Ms. Lacks or her contributions medical industry which subsequently saved countless lives. Sometimes I take for granted how crude medical treatments were over half a century ago. Add to this the factor of racial segregation and inequality and the situation becomes even more complicated. The book repeatedly toggles between Skloot’s research and communication with Henrietta’s family; Henrietta’s upbringing, life as a young adult, illness, treatment, and subsequent death. The transitions between these sections are a little jumpy at times, but are nonetheless full of detail and provide great insight into the process of cellular biomechanics. And though the scientific details are as informative as a textbook, it is offset by the novel-like descriptions and anecdotes about Henrietta, her family and friends. The latter is done with such intimacy that I couldn’t help but empathize with Henrietta and her family as though I knew them personally. Skloot was very thorough in her research and did an outstanding job sharing the rich history she learned about Henrietta, including her ancestry and the turbulent history regarding her descendants. I think every adult should read this book since they’ve more than likely reaped the benefits derived from Henrietta’s unwitting medical contributions. 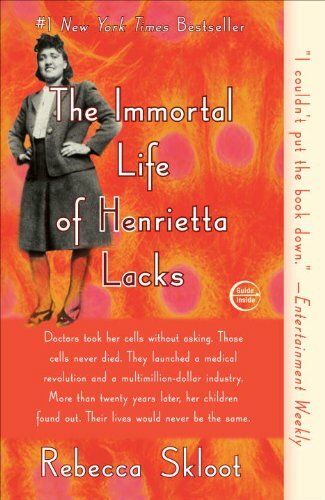 Have you read The Immortal Life of Henrietta Lacks? If so, feel free to comment below with your thoughts. This blog entry concludes my banned/challenged book highlights in honor of Banned Book Week, which continues through October 3rd. Here’s a link in case you missed my previous banned book highlight, The Bluest Eye by Toni Morrison. This entry was posted in Uncategorized and tagged banned books, Black History, cervical cancer, challenged books, cloning, DNA, Gene Mapping, Immortal Life of Henrietta Lacks, polio vaccine, Rebecca Skloot, science history, scientific advancements. Bookmark the permalink.